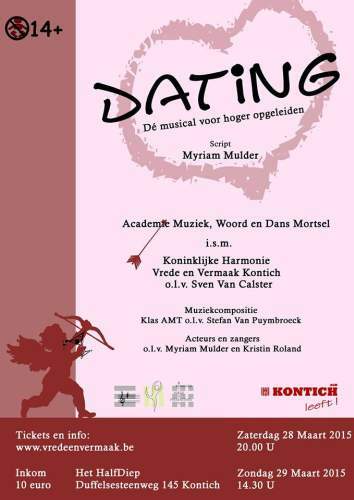 Last year, I cooperated with several other students at my music academy to write the music for a small local musical called “Dating - a musical for the highly educated” (a supposedly ironic, yet pretentious title I’m less than fond of, honestly). Being slightly unsatisfied with the end-result of my own compositions, I’ve since started rearranging them. I intend to describe the process in this little blog post. Under the wings of our arrangement teacher, we collaborated with the Word & Song division of our music academy and the Kontich Orchestra. The W&S division provided the actors, came up with a general concept and devised a tentative track list as well as additional background information we were to use as guidelines in our compositions. “Dating - a musical for the highly educated” involves a group of supposedly less than highly educated adults from out of town who’ve met up for a double date using a popular dating site. A couple of teenagers, obsessed with selfies and being young (the average age of the writing team was about 50 years by the way) take note of this and decide to ruin their fun by pretending to be each others date. Somewhere near the end, things get heated up so much that a member of the audience, using classic “breaking the fourth wall“1 techniques, calls the musical to an abrupt end by spouting some idealistic wishes on the concepts of love and relationships. At this stage, Bacchus2 and Cupido make their entrance in a rather absurd fashion and save the day by convincing the audience that yes, it’s important to believe in love. This song is played right at the start of the second half of the musical. As the cast enters the bar and spends a while having a few drinks too many before breaking out into dance, my guidelines were to create a slow “ballad” that leads into a funky, danceable second half. Unfortunately, I have no proper recordings of the actual musical, but the following track is my work-in-progress rearrangement. As I’ve yet to run it through a VST it sounds quite synthetic but I hope you enjoy it nontheless. The second piece I wrote was a very last minute composition used during the intermezzo, a time when the actors needed a brief moment to rearrange the decor. I wanted to create something mysterious and film-ish to keep the audience in suspense. At the time I had been playing a lot of Erik Satie’s work and based my theme’s base on his Gnossiennes. The further arrangements were inspired by the gothic soundtrack of Coppola’s “Bram Stoker’s Dracula”. In retrospect, I should’ve read the script more carefully; the particular mood I tried to convey with this track wasn’t the most suitable for the relative lighthearted musical it was meant for. It like the piece’s main theme but I’m not satisfied with the quick ‘n dirty arrangement so I hope to start over some time. That’s it for now! I’m in the process of rearranging and mixing several compositions in my spare time so I’ll be sure to post here when I have something new tangible.